This tree was cut down in March. 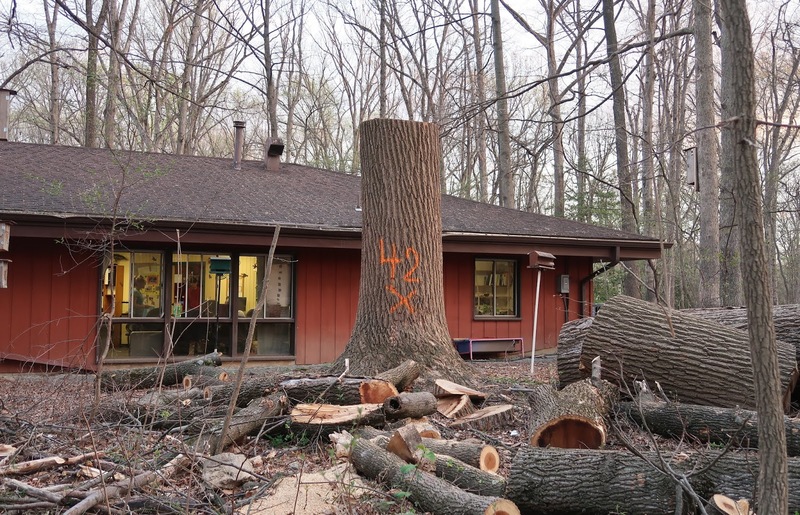 The 10-foot trunk remaining after a huge tulip poplar was cut down at the Hidden Oaks Nature Center in Annandale will become a work of art. Chainsaw artist Andrew Mallon, who has transformed tree trunks into dragons, wizards, and cats other in Annandale and nearby communities, will carve woodland creatures into the 10-foot remains of the tulip poplar. 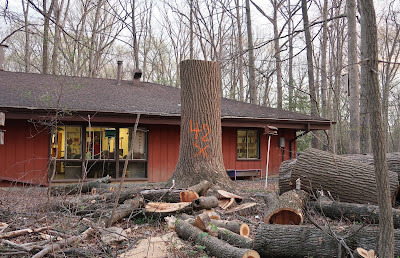 The 100-foot tree had been struck by lightning twice and had to come down as it was in danger of falling onto the roof of the nature center building. The real woodland creatures who made their home in the tree – including flying squirrels – relocated to other trees. The Friends of Hidden Oaks Nature Center hopes to raise $5,000 for the project. The group is planning a fundraiser for June 1, 1-3 p.m., with a puppet show, Ivory soap carving, nature walks, and a chance to meet the artist. There will also be some kind of craft activity with the thin circular slices, or “tree cookies,” from the tulip poplar. The nature center itself is getting a makeover. About $1 million from a park bond approved by voters will be used to renovate and expand the building. The project will include a new classroom, additional office space, and other improvements. The work is expected to start in late summer or early fall. Much of that work is expected to be completed in time for Hidden Oaks’ 50th anniversary celebration on Oct. 19. Bond money will also be used for two new playgrounds and an expanded picnic shelter at Annandale Park, which is adjacent to Hidden Oaks. In a separate project, the stream on the nature center grounds will be restored. This is wonderful! I'm so sorry that we lost the tree, but this sounds like a great way to make the best of a sad (but entirely natural) situation. The park and the nature center are two neat little treasures hidden away in plain sight, as they say. Every bit of care put into places like these is a great investment in our community and, of course, our besieged environment. I'm sorry but this killing of trees is criminal. Its hurting the Mason district macro environment thus causing an increase in the heat island affect. Let me be direct: If you care about your elder years and your children's future health and longevity on this planet, unless the tree is dead or posing an imminent danger; leave the trees alone. Only prune from the bottom.